I always hesitate to use the word "bust" because readers often associate that word with players who will have a very poor season. I prefer to use the word "overvalued" instead. As a drafter, this is what I am always looking for: value. If a player is going two rounds higher than I projected him at, I'm not going to draft him, no matter if I think he's going to have a good season or not. In this article, I recommend three players at each of the 3 defensive positions (DL, LB, DB) who I believe will be significantly overvalued heading into the 2014 fantasy season. This list will be continually updated throughout the off-season. I will continually update these throughout the off-season to reflect changes in free agency, defensive schemes, playing time, draft selections, etc. However, keep in mind that the information listed here is just a small sample of a much larger set of rankings and descriptions that are accessible through purchasing my 2014 Fantasy Football Draft Guide. DE Olivier Vernon (MIA) - After failing to do much in his rookie season, Vernon exploded in 2013 and even outshined Pro Bowl teammate Cameron Wake. He was in the top 15 for sacks and top 5 for solo tackles amongst all defensive linemen. Although he should continue to see a good amount of isolated opportunities as defenses will still key on Wake over Vernon in most situations, I'm still not entirely confident that last year wasn't a fluke. He's best drafted in the DL20-DL25 versus his current ADP of DL17. DE Jurrell Casey (TEN) - Casey had a breakout year with 50+ total tackles and 9.5 sacks. The arrival of new defensive coordinator Ray Horton will signal a more multi-front approach in which Casey will likely kick outside to end the majority of snaps. He's primarily played inside during his career, so there are some concerns on how well he will translate to his new position this year. DE Jason Hatcher (WAS) - Hatcher spent the majority of his first 8 years in the league in relative obscurity functioning primarily as a part-time, rotational player. However, extreme lack of depth on the Cowboys d-line this past season pushed Hatcher into an increased role and boy did he deliver - 34 solo tackles and 11 sacks were good enough for a top 3 fantasy finish at the defensive tackle position. However, Washington was one of the worst landing spots for Hatcher's fantasy value. He has the skill set to play a 5-technique successfully, but won't get the opportunity to produce at the same rate that he did a year ago. He's likely to be overdrafted based upon his 2013 numbers and is a player I would avoid actively seeking out this year. ILB D'Qwell Jackson (IND) – In all honesty, Jackson was one of my bigger disappointments this past season. I had very high hopes for him in Ray Horton's aggressive, hybrid 3-4 defense which made Daryl Washington an IDP God the year before. Now 139 total tackles is nothing to turn your nose up at but 64 of those came as assists and Jackson only managed 1 sack after compiling 3.5 in each of his previous two seasons. Additionally, he just looked slow to the ball in all the games I watched. He'll see an increase in tackle competition with the Colts. That said, he's shaping up to be a player I avoid in fantasy drafts this year. OLB DeAndre Levy (DET) – For a player who finished within the top 10 at his position, Levy's inclusion on this list may come as a surprise. When you take a closer look at the box scores though, it becomes apparent that Levy's season wasn't all that it appeared to be. His six interceptions greatly factored into his overall point total and he's highly unlikely to repeat that performance again. At the end of the day, Levy's ceiling is 80-85 solo tackles with little sack production. And I'm not willing to rely on him as much other than a low-end LB3 and surely not willing to take him as the 20th linebacker off the board (his current ADP). OLB Jadeveon Clowney (HOU) – There's no denying that Clowney is one of the more physically gifted defensive players to come out of the draft in the last several years and has the potential to be one of the all-time greats. He will need to polish his pass-rushing skills and prove that he can play with 100% motivation at the next level. Although the OLB classification really hurts his fantasy value, playing opposite J.J. Watt is an ideal situation. He has the ceiling to be one of the top pass-rushing fantasy OLBs as early as this season. But his unknown tackle production potential makes him a risky proposition as a low-end LB3 which is were he's currently being selected in many drafts. FS Earl Thomas (SEA) - Yes, Thomas finished as a top 8 fantasy DB in 2013 but his numbers during the 2nd half of the season were less than appealing. Through his first 9 games, Thomas was the #1 DB in fantasy. However, in Weeks 10-17, he was the 62nd ranked DB. A good amount of tackle competition, relatively low opportunity, and a stingy home stat crew, all combine to make Thomas a stay away option for me this year. In my eyes, he's just not worthy of being the first fantasy DB taken off the board as his current average draft position would indicate. CB Patrick Peterson (ARI) - For a player who has failed to eclipse 60 solo tackles so far in his four year career, Peterson continues to be perennially overdrafted. He does provide extra value in leagues that reward for return yardage. But even accounting for that, his current ADP of DB7/CB1 is not a good value. Let some other owner take the big name Peterson. FS Ha'Sean Clinton-Dix (GB) - Drafters and other fantasy writers alike seem to be higher on Clinton-Dix than I do. Although I buy into the talent level, I believe the Packers are going to utilize him in a center fielder-type role which is ultimately going to limit his fantasy value. There's a chance he could provide nice value in terms of big play production, but I'm not comfortable selecting an unproven rookie based on that assumption. Like what you've read so far? Looking to dominate your 2014 Fantasy Football draft(s)? 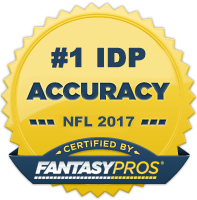 For $5.99 you can get complete access to The IDP Guru's comprehensive and exhaustive 2014 Fantasy Football Draft Guide.